Vice-President Saulos Chilima has outlined his political future, declaring his intent to be on the presidential ballot paper and that he is in discussion with some political parties to form a grand coalition in the 2019 Tripartite Elections. Chilima, who on June 6 announced he was leaving the governing Democratic Progressive Party (DPP) and that he would announce his political future at a later date, made his position known in an exclusive interview with privately-owned Zodiak Broadcasting Station (ZBS) last evening . During the 45-minute interview with ZBS managing director Gospel Kazako, Chilima said he was ready to vie for the high office of President, but asked those advocating for his candidacy to ensure a transparent and democratic nomination process. Prior to Chilima’s announcement to leave DPP, a grouping of then DPP national governing council (NGC) members and legislators under the banner of Chilima Movement, canvassed for his candidacy to lead the DPP. The movement lobbied Mutharika to pave the way for Chilima whom the President picked as his running mate in the run-up to the May 20 2014 Tripartite Elections. However, despite the calls by the Chilima Movement also known as Transformation Movement, the Vice-President remained silent on his political future. During last night’s interview, he confirmed that the Chilima Movement was in talks with a number of political parties ahead of the elections. He said a final announcement will be made “in 10 days’ time”. He said: “Other political organisations have approached me that ‘can we work together?’ Are we going to go as an independent candidate or a political party or as I said a grand coalition as was the case in 2004 when we had the Mgwirizano Coalition? That decision will be made within the next political days. On the proposed coalition, Chilima said “the amalgamation of the small political parties will remove the perceived greed we worry about and demonstrate unity of purpose, which is to see a transformed country”. 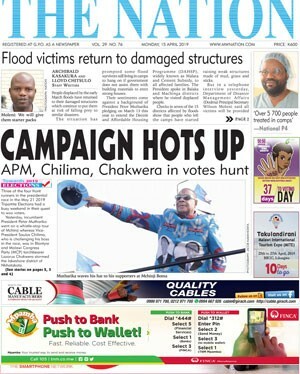 Without indicating whether DPP’s political bedfellow the United Democratic Front (UDF) is one of the parties in the proposed grand coalition, Chilima, who constitutionally remains the country’s Vice-President despite ditching DPP, also showered praise on UDF president Atupele Muluzi. He said he would welcome an opportunity to partner with Muluzi, who is Minister of Health and Population in Mutharika’s Cabinet, on a presidential ticket if both sides agreed. 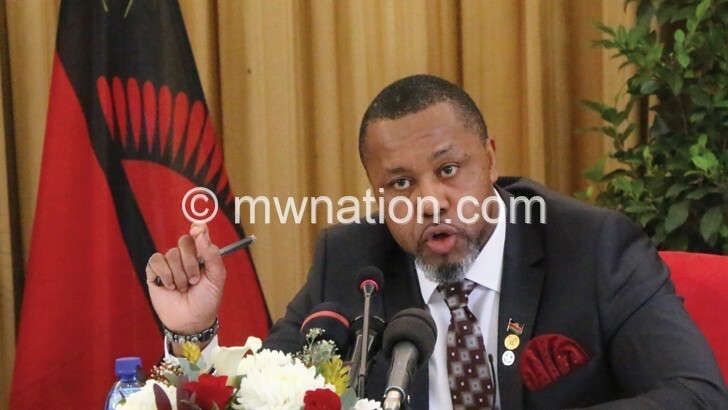 Said Chilima: “We could explore how best a partnership could be structured. It presents a unique combination. Obviously, what is the heat of the moment is the ‘youth quake’, but obviously it is not just the issue of age, but youth who are progressive, delivering. When contacted yesterday on Chilima’s sentiments, Muluzi said he could not comment on the matter until his party, which formed the country’s first multiparty administration in 1994 led by his father Bakili Muluzi, holds its convention on August 1. Reacting to Chilima’s remarks, political analyst Nandini Patel yesterday said the news of a possible coalition was welcome and could prove a formidable force in the elections if the parties involved do proper ground work. She said: “Some of the parties, including PPM [Progressive People’s Movement], have some experience in elections and that can help them if Chilima decides to contest. “If Chilima and the coalition are to succeed, they must work quickly on a pre-election alliance with a working relationship beyond national elections. But they should avoid mistakes which Mgwirizano Coalition made by just focusing on presidential elections while the various parties fielded own parliamentary candidates which created confusion. In the ZBS interview, Chilima urged the Chilima Movement to stop bearing his name, describing such personalisation as part of the “old disease of glorifying leaders”. The movement’s branded motor vehicles are inscribed Transformation Movement with the portrait of Chilima and his initials SKC standing for Saulos Klaus Chilima. Some critics have also accused Chilima of using the Catholic Church as a platform for advancing his political agenda. But Chilima, a devout Catholic, defended his association with the church, saying the Catholic Church encourages its faithful to participate in politics. He said what the Catholic Church cannot do, though, is to take a partisan stand to support a particular candidate. Former first lady Callista Mutharika—widow of DPP founding president and the incumbent President’s elder brother, Bingu wa Mutharika—sparked the succession debate in April this year when she said her in-law, 79, should pave the way for the comparatively younger Chilima, 45.